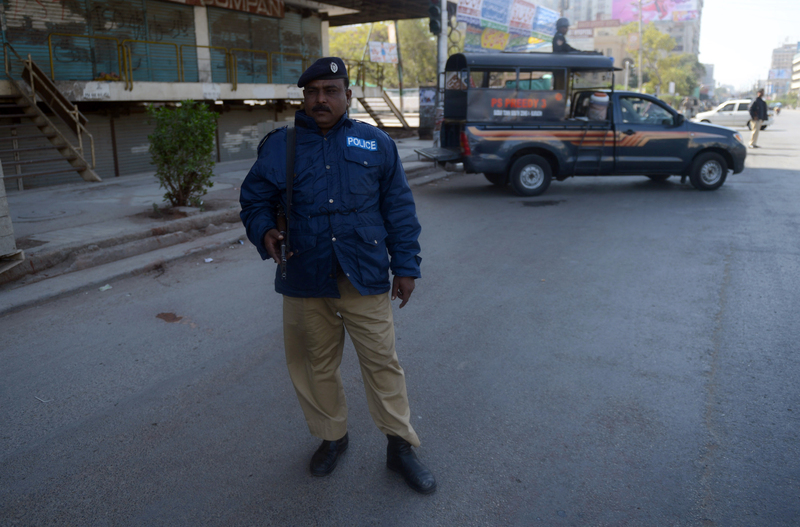 Policeman stand guard in Karachi, February 2013. Kidnapping in Karachi is big business, with criminal gangs, political groups, and militants all using abductions as a fundraising tool. Late last year, I interviewed Imran, who was kidnapped and held by the Taliban for three months. I’ve written up his story for the New Statesman. Imran was on his way to work when it happened. Two motorcyclists pulled up on either side of his car. The man next to his window showed him a gun, a standard technique by thieves on Karachi’s hectic streets. Assuming he was being mugged, Imran held his hands up to show he was unarmed and handed over his phone and wallet. It was not enough. The gunmen forced Imran and his driver out onto the street. They held a gun to his head, blindfolded him, and bundled him into a nearby car. You can read the full piece over at my NS blog. The threat to journa­lists comes from terror­ists, but also from the powerf­ul securi­ty establ­ishmen­t. Drones are not going to go away and they are not going to stop being contro­versia­l. With parts of Pakist­an slippi­ng out of the state’s contro­l, an effect­ive police force would be a good place to start. 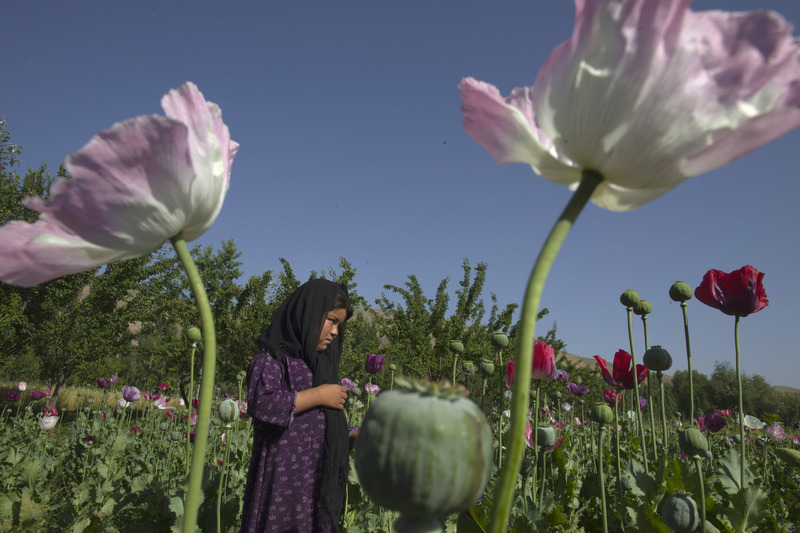 A 10 year old girl stands in a poppy field in Fayzabad, Afghanistan. 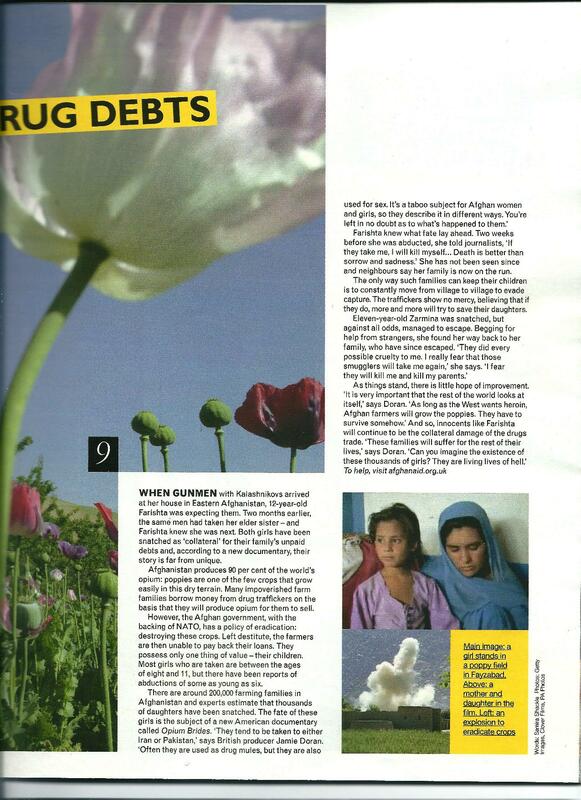 The drugs trade in Afghanistan is having a terrible human cost. The documentary “Opium Brides“, made by Clover Films, looks at the plight of poppy farmers who have taken loans from drug traffickers. Due to the government’s policy of destroying crops, these farmers are often left with huge debts and no means of repaying them. As a result, traffickers are seizing their children, who can be as young as five or six. Journalist Najibullah Quraishi travelled into the Afghan countryside to interview families trapped in this situation. I interviewed the film’s producer, Jamie Doran, for a recent issue of Grazia magazine. The cutting is below. 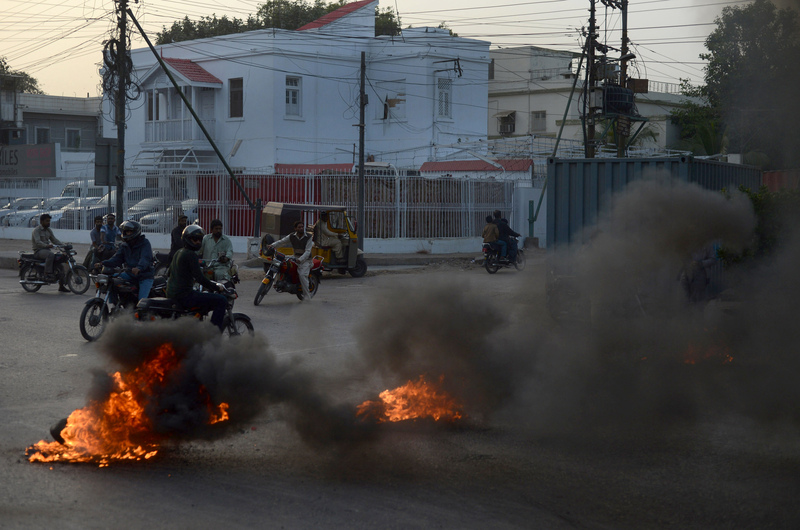 Tyres are set alight at a rally in Karachi, 12 January. Karachi is well used to violence, but 2012 was one of it’s bloodiest years ever, with 2,000 people dying in political and ethnic violence in the city. My long feature for the Independent on a bloody year for Pakistan’s biggest city (and my home for much of last year), has just been published. You can read the full piece here. On a hot Karachi day in October, Amina’s husband Khaled went to work and didn’t come back. Two days later, she was identifying his body in a morgue. He had been shot in the head on his journey home from the factory where he worked. “He was killed because we are Pashtun-speaking people and they don’t want us here,” she says, sitting in the house where she lives with three children she must now support alone. Visibly uncomfortable, she will not name the “they” who she holds responsible. Like many others, Khaled’s death has not been investigated and no-one has been arrested or charged with his murder. In a city where people die every day in targeted killings, his is simply another name on the list. The impoverished area where Amina lives is inhabited mainly by members of the Pashtun ethnic group, who have moved in large numbers to Karachi from northern Pakistan.